Vegetative Description: Leaves are usually a brilliant green with serrated edges. Tasting Note: Lemon scented flavor with a suggestion of mint. 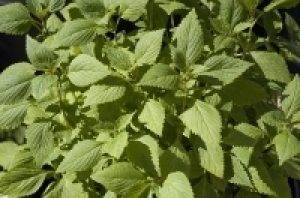 Because of it’s lemon flavor, we prefer to call it “Vietnamese Lemon Mint” or “Vietnamese Lemon Balm”. Culinary Uses: Eaten raw in a variety of soups and meat dishes. Also found on herb plates. Medicinal Uses: Used in tea for soothing properties and leaves used in steam baths for better skin. Propagation: Grown from seed or rooting mature stem in water or soil. Log in | 72 queries. 0.200 seconds.